The original Washfountain dates back to 1921. This revolutionary product changed handwashing in many factories and commercial washrooms. 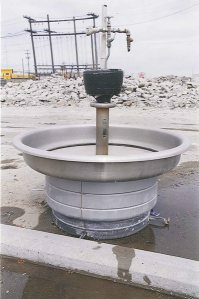 Each Bradley Washfountain could replace eight china sinks saving water, space and break time spent in the washroom. 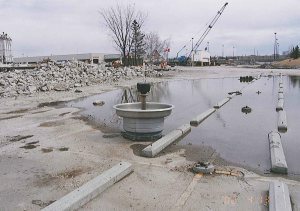 It is no surprise that Canada Metal installed a Bradley Washfountain in their complex, but the mystery is why was it saved? Where is it now? Using pictures the passerby provided, it was easy to locate the address of the picture taken in 2002. As you can tell by the picture below there is a business named “Best West Pet Foods” near the location of the Fountain. A search provided an address and thanks to Google Earth a picture of the area 10 years later is also shown below. 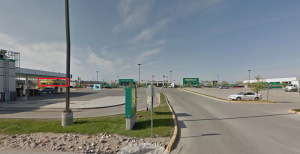 The rubble is gone and in its place is a large parking lot serving a “Real Canadian Superstore”. 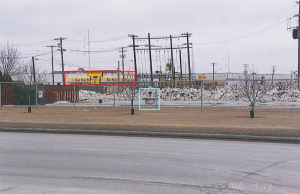 The Bradley Washfountain is since gone but the small blue box on the 2012 picture gives you an idea of where it would have been located 10 years ago. Did someone think it was too unique destroy? Was it going to be recycled? Or, did the construction guys just become too lazy to move it the last 20 yards to the dumpster? Why the fountain was sitting there amongst the destruction we might never know. However, this picture illustrates the craftsmanship, innovation and quality Bradley invests into every one of its products. Even amid chaos, Bradley products stand strong.